Fleas are nuisance creating parasites that feed on warm-blooded animals. In case of severe infestation and non-availability of hosts, those prefer to feed on the human. Fleas are small and wingless pests that grow up to 2.5 mm long. These pests are reddish brown in color and covered with microscopic hair. The parasites are good jumpers and can jump up to 7-8 inches vertically and 14-16 inches horizontally. The fleas require a warm and humid condition to grow and reproduce. The pests can easily move through the animal fur for their physical attributes. The fleas transport themselves on rodents as well as other mammals. Pets, as well as wild animals, easily get infested by fleas. The popular pets like dogs and cats carry fleas on their body when the animals move outside. 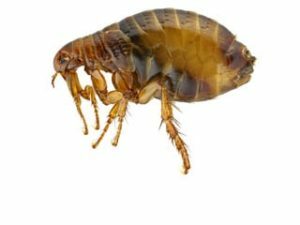 The fleas infest the interiors once they get carried by the pets. Fleas depend on its host to survive with the blood meal. It easily attacks furry pets to continue the feeding activity. The lifespan of a flea is 100 days and within the period a female flea is responsible for producing 400-500 offspring. It is a big challenge to eliminate the fleas from the interiors as well as exteriors. You must have an idea about the types of fleas, the health issues developed due to fleas and the symptoms of flea infestations. Consulting the professional pest controllers for flea treatment is the best idea. Identifying the fleas is easier though prevention is challenging! Do you most often prefer to implement your DIY skills to get rid of some problem? Our area of expertise includes perfect treatment of fleas of different species.